Renue Derma Review: Is Renue Derma A Scam Or Legit? 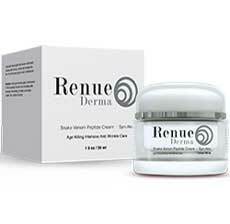 Renue Derma is marketed as a topical skincare treatment that fights skin aging. It is said to utilize key ingredients that have been shown to improve the condition of facial tissue reducing different aging signs. The special skin care formulation is said to diminish fine lines while minimizing wrinkles and lifting saggy skin. It claims to restore the youthful appearance and texture of the skin within a few weeks of use. The product claims to be a safer and cheaper alternative to Botox injections and other anti-aging cosmetic procedures. There is no price stated on webpages about the product but a free trial is being offered. One notable weakness of Renue Derma is the lack of information on its manufacturer. It is not even stated where the product is being made which poses questions regarding the product’s quality, effectiveness and safety. Several websites only offer a free trial of the formulation but there are complaints saying it is not really free. The Stimulation of collagen production in the skin – it is best to apply the formula in the morning and evening to encourage continuous collagen production. This will address the main problem that causes skin aging signs to develop which is the rapid decline in the skin’s collagen that happens naturally as a person gets older. Provides continuous hydration – the product doesn’t just moisturize the skin temporarily but it ensures long-lasting hydration. This helps protect the skin from rapid aging which contributes to the slowdown of the development of skin aging signs. Diminishes wrinkles – it uses special active ingredients that are said to gradually reduce the severity of fine lines and wrinkles. It rejuvenates the skin which makes it smoother in order to offer permanent results in reducing the signs of skin aging. Another major flaw of the skin care treatment is the lack of information on the actual ingredients that make it work. The websites offering a free trial only mention that it uses powerful moisturizing ingredients and those that help boost collagen production. It is also said to contain ingredients that target fine lines and wrinkles. It is recommended to wash your face (you can use any cleanser) then dry it carefully before you apply the anti-aging treatment. Spread a very thin layer of the formula all over your face but you can also include your neck area if you want. Then, massage the formula gently onto your skin and allow it to dry completely before applying other skincare products. Because there is no information on what the special skincare treatment contains, you should try it first on a small area of your skin then observe. If the area starts to get irritated, this may be an indication that you are sensitive or allergic to ingredients so you should wash the area with water and not continue to use the product. After careful research on Renue Derma, it is not a remarkable anti-aging skincare treatment. It is just mediocre at best and the main reason it is worth trying is because there is a free trial being offered. The biggest problem with the product is the lack of details on the key ingredients. There are some feedbacks saying it works but most feedbacks on the product say it doesn't really deliver considerable anti-aging results.